The land of dawn-lit mountains, Arunachal Pradesh was waiting for us to be discovered. We had read and been told that it is a wild and remote region of India. After cycling through Manipur and Nagaland we had now reached Assam and got acquainted with India a little bit more like the mainland. We were eager to cross the Brahmaputra and head back into the mountains for fresh air and quiet. 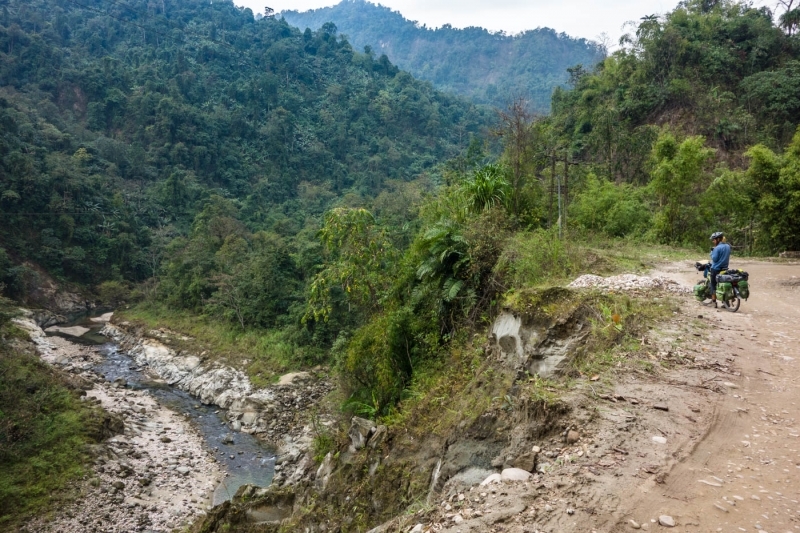 The road from Likabali would eventually drop down in the valley to Zero (Ziro). 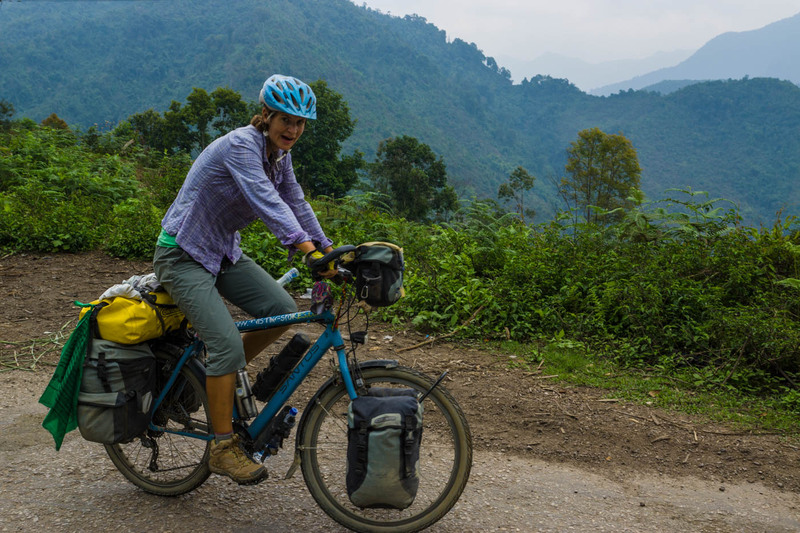 The photos can be found here: Dibrugarh to Dumparijo and Daporijo to Ziro. In Dibrugarh we were kindly hosted by the parents of Partha our Couchsurfing host. They fed us, helped us to find a dentist and even arranged a television interview for Assam Talks on the morning of our departure. We had nice conversations about e.g. the main food staple in our countries and our views on Europe and India. The dentist visit was quite an experience in this town which is quite messy and noisy. We had also met with Tanvi and on our way out of town we visited her for a last goodbye. After figuring out that there was not really a boat from Dibrugarh to Pasighat (taking 8 hours and it still involved at least 60 km of cycling), we opted for the direct option 20 km west of Dibrugarh. 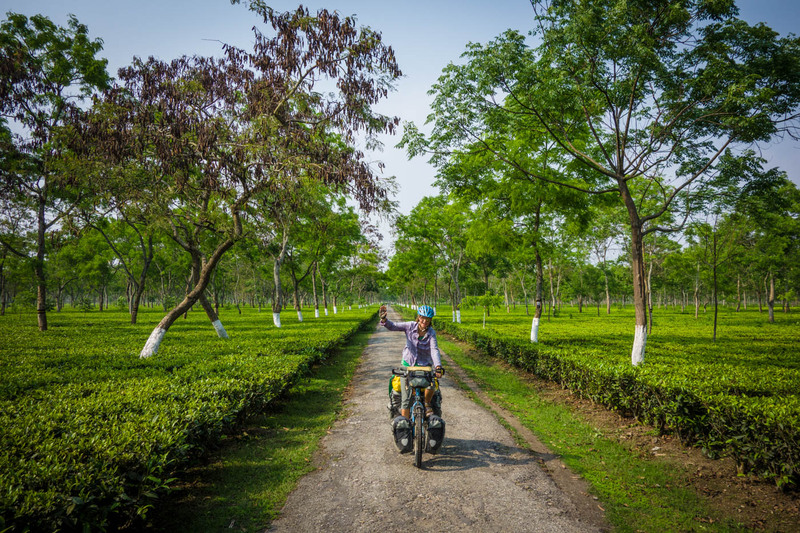 The cycling was nice along many tea plantations. When we arrived there were boats waiting and we could hop on one straight away and were ferried across the huge Brahmaputra river in 2 hours. The river has become increasingly low in dry season because of damming in China and the use of the river for agricultural purposes. The boats really need to avoid the sand banks in the river to avoid getting stuck. We headed for Silapathar for our first nights rest and were not feeling well. Now after two years of travelling and cycling we are noticing that our bodies and minds sometimes are a bit tired. It is quite intense to be on the move so frequently, see so many new things everyday, communicate with new people every time and have not a real sound steady base. On top of that we have been plagued by bad stomach, flu, broken tooth and general aches. So we feel the current time is a bit tough on us. It helped to just spend the day in bed watching series on the TV (what a luxury!) and eat in the guesthouse restaurant. The next day we thought we were ready, reenergised and motivated for the mountains. But soon we found out that our emotions were still a bit vulnerable. 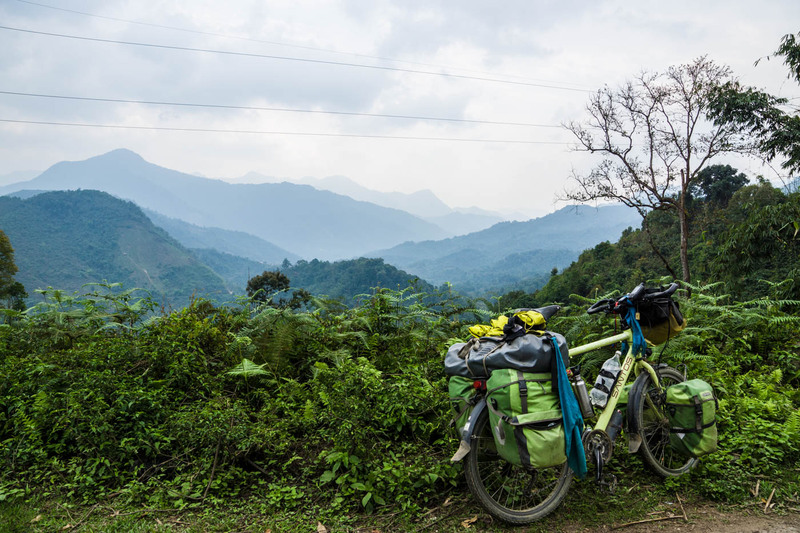 We chose to go out and cycle anyway with stops along the way to talk, rest and get back the feeling we had when we were planning to cycle in Arunachal Pradesh. Because we are very motivated to cycle here!! But… when the road goes up and the tension in the legs rises and the mind is not committed it is hard sometimes. We did cross the official checkpoint and had our permit checked with the official ‘permitshow’ and received permission to continue onwards. So the permit was useful! It took two-and-a-half days to reach Basar. In the while we found our motivation. Do not underestimate Arunachal Pradesh. It is a real jungle out there. this region has been inhabited by indigenous people for a long time. 26 different tribes house here all with their different ideas and ways of life. Life has been close to nature but also nature has been used for survival. Arunachal Pradesh has many native natural medicines and the indigenous are also very skilled in finding these plants. There are research centres in small scale because in some area there is a very small rate of cancer and other diseases and this might be due to certain plants. From the moment we left Likabali it felt remote but still there are villages along the way. The pavement is rough and bumpy and every time we have the chance we stock up on provisions. The locals very much care self sustainable for themselves. The jungles is green, it carries fifty shades of green and is lush. We are being told that rainy season has started and we hope for the best. Our motivation was very much helped by friendly people along the way and some of which opened their houses for us. We met a Dutch/German couple on a motorbike who are traveling in the North-East States and had a nice chat. In the village Siji we came across the passengers of a car that had driven up with us on the road and had waved a few times. They invited us to rest and eventually invited us into their home. Mipu and her sister lived in this village together with her mother who is the third wife of a man who lives in Likabali. Mipu shared her story that breast cancer had been discovered three years back and she had been treated in Mumbai and received chemo therapy. It was very interesting to here more about her story, her family and this region with Gallo people. The houses in this region are also very beautiful and very sturdily made out of bamboo. On the road the traffic density was very low. We came across a few sumo’s, trucks and cars, but the main companion on the road was the Indian army. The road that we were following leads up to Along (the district capital) and Mechuka, a place that resembles Switzerland and we had decided not to visit. The road from Mechuka also leads up to the border with China. Daily army convoys ride up and down the roads with many many armed trucks and hundreds of army guys. They are all very friendly but it is a very strong show of arms and there are some huge army bases in this area of Arunachal Pradesh. The road is also being prepared to become a two lane road instead of the current one lane road. This is a five year project and we think the main reason for this road is the usage by the Indian army in the future. In Pading village we also got invited into the home of a family. The mother of the family was named Carmen and we were introduced in this village by one of her cousins who we met on his way home from school. 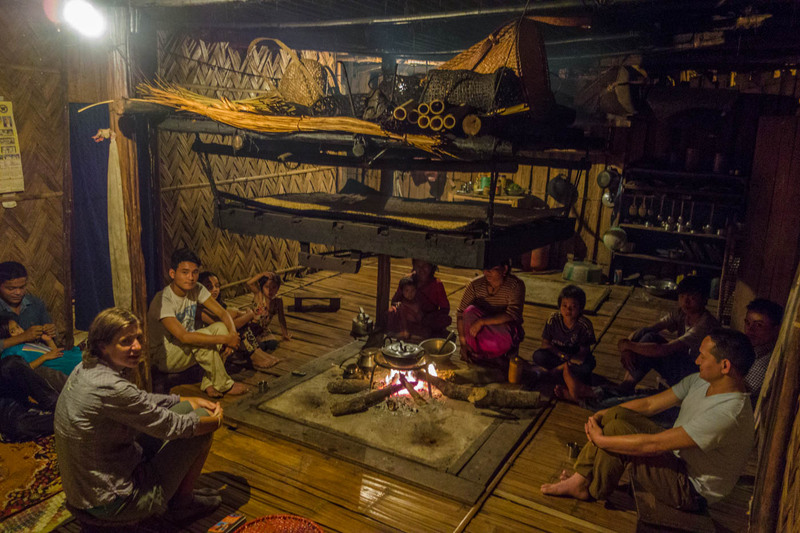 We enjoyed the evening around the Immik, the local fire place, inside the bamboo house. Above this fire place they dry food, this can be pork or rice or others. The family cooked for us and we enjoyed the locally grown rice and vegetables from the jungle. We were allowed to sleep in the room of the son inside their home and were very humbled by the invitation. In the morning we were asked if we would like to see the village Bunyan tree and we had a nice morning walk with family and friends. It really was a special situation! Through these little moments of happiness we were reenergising. It always costs a lot of energy to be hosted by a local family because of the interaction, different food, different timing and unpredictability. At the same time it also is one of the main reasons we travel this way: to come close to people, to see how people really live and how they enjoy their lives and make the best of it. We learn both ways and can share our experiences and learn from theirs. The following day we always talk about the experience and share together what we have seen, what we have learnt and how we view the situations. In many villages we see that alcohol and tobacco has a significant role, which saddens us but we are also not here to judge. The same for religion and the rise of Christianity also in this region which we had not expected. The difference between villages is quite clear. Some have churches and crosses in the village, other villages have flags with a red sun. This is a signal of the religion of the sun and the moon that the locals believe in. We feel that the locals are making it quite clear to which they belong through their symbols, also through necklaces. From Pading we crossed the mountain that they call Everest because it is quite steep. After we had lunch in Basar which did not make a huge impression on us. We cycled out and were met by Izum. He just wanted to have a chat with us and decided he wanted to invite us to his home in Tirben. We cycled the next 12 km down the mountain and reached the village. After some searching we found him. He was living together with his brother while he was back in his home town. He is a teacher in a different district and the school is off at the moment after final exams. We learned from him more about the religion and about the generational family line in Gallo tradition. He says that everyone in his family from the same generation is his brother or sister and that the children of them are his sons and daugthers. This also means he needs to care for them as much as for his own son or daughters. The generations are recognisable with a certain way of name spelling and everybody from his generation is named with an “I”. So we learn more and more. From Tirben we reached all the way to Dumparijo to eventually find the first IB house to stay in. IB stands for Inspection Bungalow and it is a guesthouse for inspectors to stay when they are in the region, also called Circuit House. After searching for the District Officer for permission we finally were lead to the house on the top of the hill and settled in. We were taken well care of by the caretakers. Soon we followed Subansari river and were in Daporijo and although there were some interesting locals and local culture to be seen we were not so impressed by the messiness of it all. We cycled out only to make it 10 km up the next mountain and it started to rain heavily. After waiting out the heavy rain at a shop for two hours it was getting dark so we hesitantly decided to turn back to Daporijo and find a place for the night. 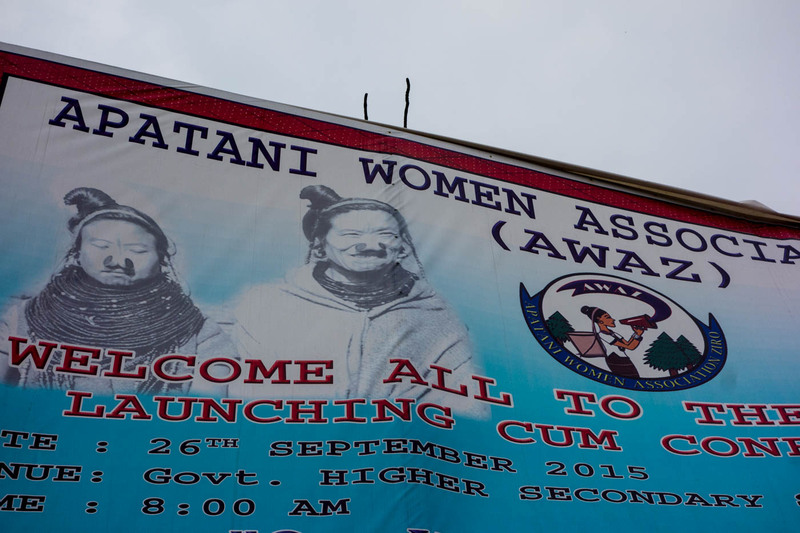 The local culture in Arunachal Pradesh is very interesting. There is a very old tradition and you can really sense that the people have a story to tell. The jungle is dense and animals have always roamed freely. There are still signs warning for tigers, we have seen monkeys along the way and there should be some wild elephants two mountains further than where we were. Medicinal plants grow among huge fruit trees and we see small waterfalls when we cycle around the corners of the mountains. It all makes for a very impressive area. Arunachal is not highly visited yet and people are always very amazed to see us, which is nice. The upcoming smartphone and selfie culture on the other hand is sometimes a bit disturbing and stands in the way of making meaningful connections. After we finally made it up the mountain we enjoyed being in the wild jungle. 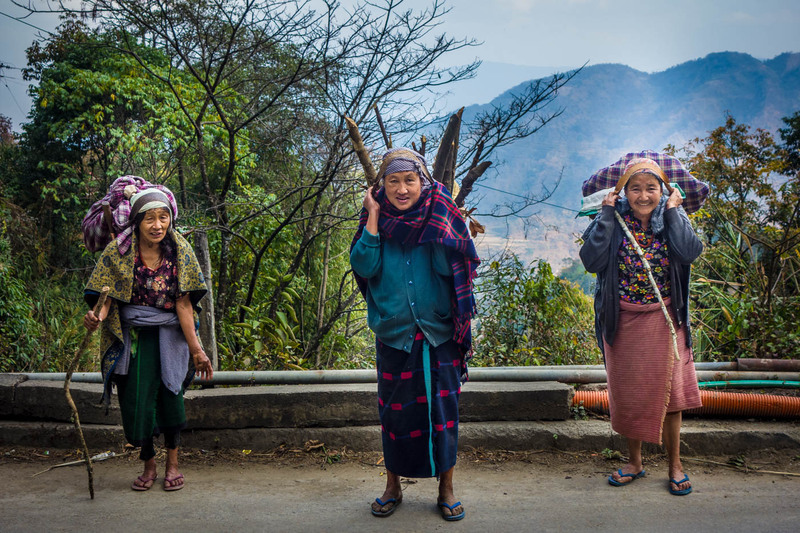 Women carry wood in their baskets up and down the hill, sometimes even small girls. While we were waiting in the rain the previous day we saw quite a few women on bare feet in the rain with giant leaves as umbrellas. Really powerful and such a different way of life as we know it. We have many questions how it is possible that even in towns and cities here people can bare to live this way. Live without proper sanitation, without healthy water. It should be possible to arrange this in a way that it is accessible for everyone. We have been exposed to some nasty creatures in the jungle. The most vicious of these are flies. We have giant bulges on our lower legs because of fly bites which are heavily reacting, itching and infecting. The road up on the mountain was pleasurable albeit a bit bumpy. We cycled up and down. Found a place to sleep at a very rundown IB house in Puchigeko and the following night in an animal house which was empty where we could camp. By sleeping independently (and not being hosted) we could manage our timing a bit better and be on the bicycle early which made especially sense on the climb just before Zero, where we went up from 300 to 1800 meters in one go. We dropped down into Zero (Ziro) valley and the first woman we came across had the striking Apitani features with facial tattoos and noseplugs. We were amazed and had not realised that we would see the old local tradition so clearly. The women are very modest and do generally not like to be photographed which we respect. Although in the photo culture that India has become it is hard for anybody to say no to being photographed. In Ziro we are taking care of ourselves and buying supplies for the next stretch in Arunachal Pradesh which we look forward to. It is a bit more fresh here than expected so we are trying to stay warm, dry and motivated and enjoy what we see everyday in this magical place with dawn-lit mountains. 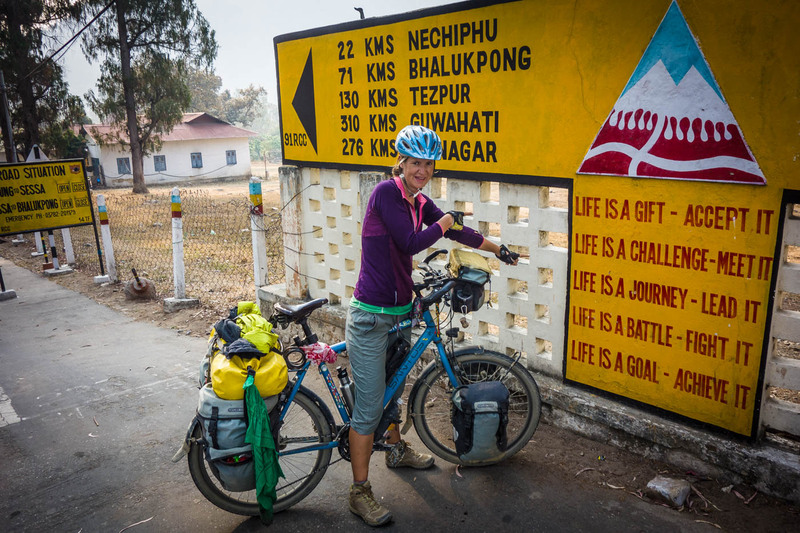 I wasn’t sure whether I wanted to cycle through India on our cycle trip, but reading through your posts and looking at your photos, I think I do. I’ve been to India a couple of times, and I think this is why it puts me off cycling there, but I guess the rural areas and mountains are going to be completely different.